Since the passing of Google’s Picasa and Windows Live Photo Gallery, we have been receiving a lot of questions from readers asking about a replacement photo manager. Today, after receiving another email asking this question, we began to wonder if we were overlooking something. Were we missing something in Windows 10? 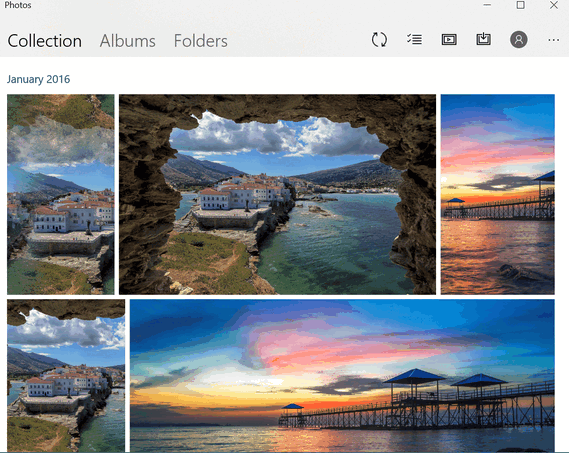 It’s hard to imagine that Microsoft would not have some kind of photo manager for Windows 10. After looking around for a while, we found it… and it’s already on your Windows 10 PC, right there on the Start menu. 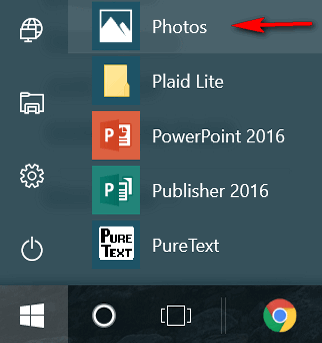 It’s called, not-so-creatively, “Photos” or officially “Windows 10 Photos App”. 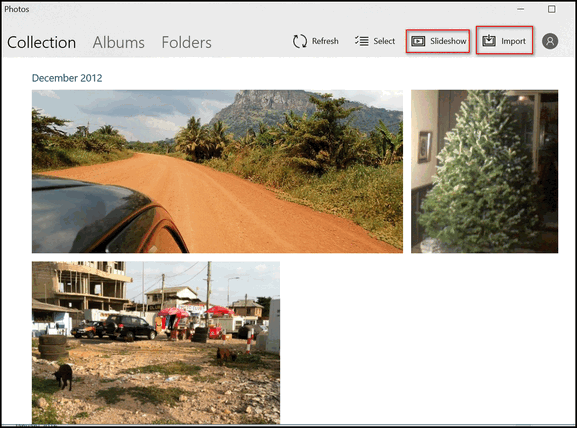 If your looking for and easy to use photo and image manage and an easy way to organize and/or browse all the photos on your PC and connected drives, you might find “Photos” just what you’re looking for. Ready to give it a try? OK! “Photos” gives you a lot control over your photos and images. You can even click and send them to Windows Photo Editor for editing. Windows 10 will try to gather related photos together for you, and put them in albums. Or, you can create albums yourself. Create a slideshow of your images, or import from your digital camera or other device. Or share your photos right from Windows 10’s Photos app. 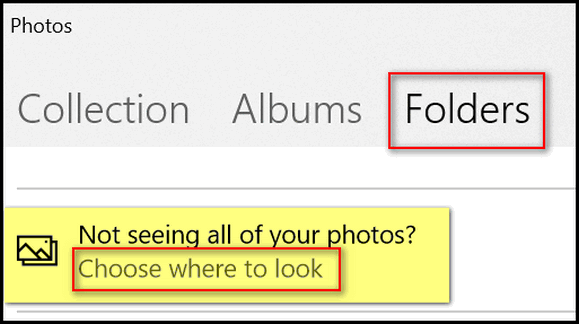 If Windows 10’s Photos app doesn’t find all your pictures, you can tell it where to look. Click on “Choose where to look” to add images Windows 10’s Photos app didn’t find automatically. If you need to edit your photos, you’ll need to edit them in a photo editor, or click on “Share” then click on “Photo editor” If you do this you’ll be surprised. You’ll be using a very easy to use, but powerful editor by Aviary. You have a lot of options for editing, enhancing, and adding effects to your photos & images. See? A lot of editing options available just using the built in photo editor. 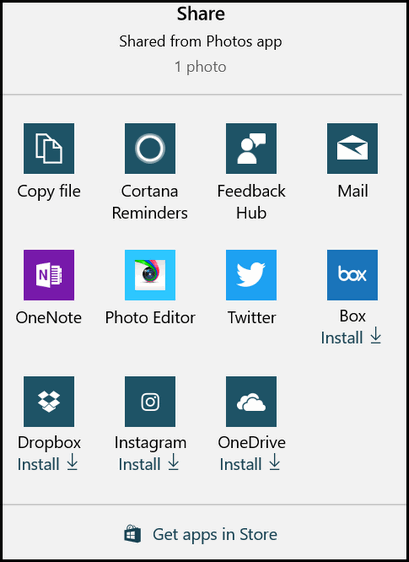 Windows 10’s Photo App may not be as feature-full as Picasa, but if you’re looking for an easy way to organize your photos & images… and more. Give it a try. I GOT A BIT OF A HEAD START WITH THIS EARLIER TODAY. I WANTED MY PHOTOS TO BE MY SCREENSAVER, BUT WHEN I SAW THERE WAS NO WINDOWS PHOTO GALLERY FOR WIN 10, I THOUGHT I WAS DOOMED. DIDN’T KNOW HOW I WOULD EVEN GET MY 10.3 GB WORTH OF PHOTOS INTO WIN 10 FROM WIN 7 WHICH WERE ON AN EXT HD. I ALREADY KNEW THAT I COULD CUSTOMIZE THE SCREENSAVER AS I HAD RESEARCHED THAT. (I AM NEW TO WIN 10 AND AM IN THE PROCESS OF LOADING/TRANSFERRING.) TC CAME TO MY RESCUE WITH THIS INFORMATION ABOUT AN ALREADY AVAILABLE PROGRAM IN WIN 10. IT IS SO EASY TO TRANSFER, TO NAVIGATE AND TO VIEW. I DO HAVE TO GO INTO SOME FOLDERS TO IMPORT SOME REMAINING PHOTOS, BUT IT LOOKS SIMPLE, ACCORDING TO TC’S DIRECTIONS. I WAS ABLE TO DELETE DUPLICATES. AS THE PHOTOS ARE A GOOD SIZE AND IN A GOOD FORMAT. I CUSTOMIZED MY SCREENSAVER AND MY PHOTOS POP UP AS I AM ACCUSTOMED TO. THANK YOU AGAIN, TC, FOR ANOTHER GREAT PROGRAM TIP. I AM ONE HAPPY CAMPER TODAY. (I’M GLAD THAT ONE OR BOTH OF YOU PICKED UP ON MY KIND OF “GRUMBLING SENTENCE” IN A THANK YOU EMAIL!!) LOVE YOU TWO, YOU ARE THE BEST. I also have been using since the beginning. It’s a great feature. I took just love these 2 that help us out so much all the time! Thanks Dawn. Thanks for reading too! I like the photos app but why are some of the dates wrong? My first album was taken in June of 2010 when I retired and the date on it says 11/7/2206. There are several others like that and it has been this way since the beginning of this app. I haven’t found a way to change it either. Other than that, I like using it. I am no expert with Windows Photo App. But I believe it gets the dates from the “last modified” date. If you right-click on a picture, and look at properties, you may not see the date it was taken or created (that would be in the metadata), you are going to most likely see the date it was imported from your camera, moved to a different folder, or last viewed. That’s my guess. If you want the scientific answer, perhaps some genius at Microsoft can explain it. One thing I know for sure, the photos app is not getting the date from the metadata… at least not on my PC. Thanks for reading. I don’t seem to have the photo editor when I hit share. Doesn’t show that option. in the Run box and press Enter. Are you logged in with a Microsoft account or with a local account? If you’re logged in with a local account you won’t have any access to the Windows store apps. I am logged in with a Microsoft account. Then I am at loss why you don’t have that option on your PC. You can get the Aviary app from the Windows Store. I don’t recall having to install that app, and neither does Darcy, yet we both that option to “Share” with the Aviary Editor. Ok, I will try that. I have 3 PC’s and not one of them have that option. Thank you for trying. Aviary is available, as an app, from the Windows store. I have the same problem. I don’t see the option for the editor. version 1703 and Microsoft acct. 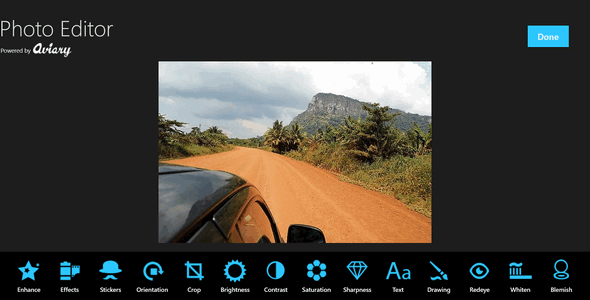 As we answered, you can download the Aviary editor for Photos app free from the Windows Store.